Green Globe recently awarded Gold Certification to Monte-Carlo Bay Hotel & Resort. MC Bay and sister property Monte-Carlo Beach Hotel are the only hotels to receive this accolade in the Principality to date. Environmental best practice is a priority at MC Bay with a major focus on energy conservation strategies. A new Smart+ pilot project has been launched in Monaco, other current and new programs have been instigated, and the hotel has received awards acknowledging its wide-ranging sustainable initiatives. On 23 March 2018, the Monte-Carlo Bay Hotel & Resort signed the National Pact for Energy Transition at the Grimaldi Forum. The property will be the first pilot establishment in Monaco to implement the Energy Transition agreement thereby cementing its commitment to environmental protection. “A hotel consumes a lot of energy, especially through lighting, heating and hot water usage. Making our facilities energy efficient was therefore a major environmental issue,” explains Achour Daïra, Technical Director since 2011. Today, the hotel successfully reconciles quality of service, competitiveness and energy management. In particular, the installation of the Smart+ pilot system will save the equivalent of energy generated in one month. – Installation of photovoltaic panels on the hotel roof that will produce 170 000 kWh/year. This project is planned to begin within a year. MC Bay will generate less than 8 million kWh/year as early as 2019 by implementing these energy-saving initiatives. In doing so, the property will have reduced its energy consumption by nearly 30% in only 8 years. The crowning success for Monte-Carlo Bay Hotel & Resort that acknowledges its green actions has been the Green Globe Gold standard and being certified an Eco-Leader by TripAdvisor. Furthermore, in May 2017, the hotel was the first hotel to obtain the Trophy e+ in the presence of the Minister of State and authorities. 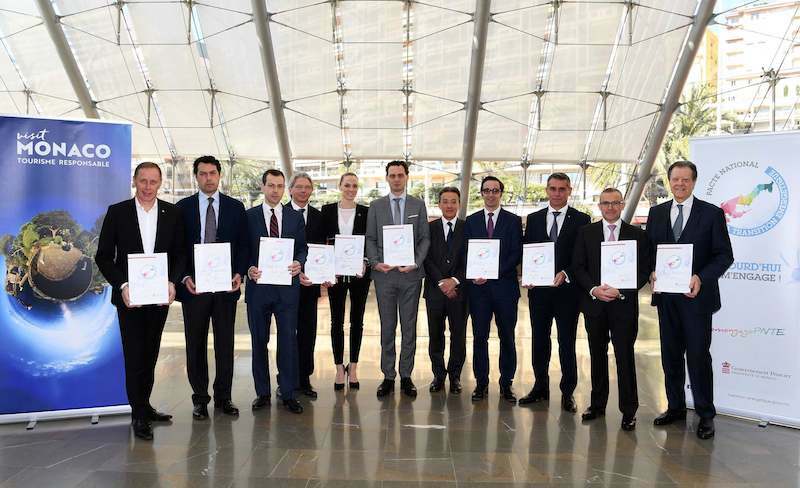 SMEG holds the award ceremony in recognition of Monegasque companies and individuals who have contributed to a more responsible means of consuming energy.